One of the most interesting MSc Projects I’ve supervised recently involved me working with Richard Wilkinson, looking at the ways in which technology can be used to motivate learners. We took some of the highlights from his research study at Coventry University College and made this into a paper for the HEA STEM Conference. Here’s the slides I used for the talk (they are also available on my SlideShare account). The session was well-received and led to plenty of discussion about the role that technology plays in education and why students did not seem particularly keen to engage with student media as part of this process. Definitely an area worthy of further exploration. Here’s a quick way to jazz up presentations and to offer a talking point. It’s to generate a word cloud for an appropriate site, which you can do easily using Wordle. Just type in a url, or copy in a section of text, and Wordle will generate a well-formatted tag cloud showing the most terms on that site (excluding English language filler words). It’s interesting, as they’re often not the terms that you expect to be used most. 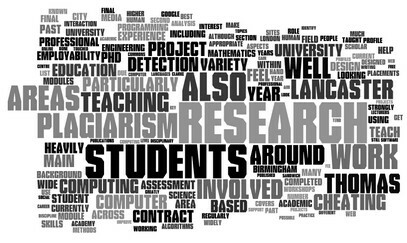 Interesting that the word research dominates teaching. It feels the other way around. I’m gla to note that students is prominent. I think this one is more coincidental based on the topics I’ve been promoting. It doesn’t feel like I’ve written a lot about search. I’ll have to regenerate it when there are a few most posts on the blog. Both of these are up-to-date at the time of processing, of course. You can play around with these a lot to change the layout style and formatting, but I’ve found that even the randomised default settings will give you an interesting slide to include in a presentation. Have you had any luck using word clouds? Just reply below and share your experience.